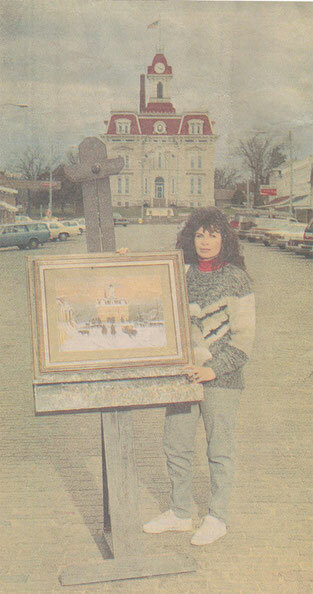 Judith Mackey has been a professional artist for over 50 years. A native Kansan who still resides in the Flint Hills, she paints what she is most familiar with—landscapes of the prairie, working cowboys and the ranch life that surrounds her rural Chase County home. She feels overly blessed to live in the area which she paints. Judith first develops her painting's layout and form on location. She then finishes the paintings in a more deliberate manner in the studio, adjusting the composition and values, and selecting significant details. Although she may take a reference photo or two, she depends principally on her intimate knowledge of the place she lives and loves. The artwork of Judith Mackey hangs in museums and permanent collections nationwide, including the Kansas Governor's Mansion and the Tallgrass Prairie National Preserve. Her honors are innumerable: "PrairyErth" Original Cover, first woman in American Royal Western Art Association, American Women Artists Master Member, Save America's Treasures at the White House, Bill Kurtis' Artist in Residence, a CBS Documentary, a New York Times Article, a lead story in nearly every major Kansas Newspaper, and many others. it is with a heavy heart that we announce Judith Mackey's passing, she went to be with the Lord on February 20th, 2019. She will forever be remembered as a great artist that loved the Lord and her family.